“May 4, 1923 – March 6, 2011. George Tiedemann went to be with our Lord near midnight Sunday after suffering complications of a long battle with end state renal disease. He passed peacefully in the nursing facility at Brookdale Senior Living. He was preceded in death by his parents, George Karl Tiedemann and Margaret Stoltzenberg; sister, Mae Brown; and beloved wife of 62 years, Lucy. He is survived by his children, Nancy Tiedemann, Bonita (Harold) Lindsay and Mark (Esther) Tiedemann; cousins, Hugh Teal and Don (Marge) Teal; four grandchildren; and one great-grandson. He was born in Chicago with congenital tuberculosis of the bone in his left hip. At 11 years of age he had surgery to allow him to walk and his parents moved with his sister to a farm in Edwardsburg, Mich. He had a very successful career as an estimator for window and ornamental metal companies around the country. He retired to his final residence in Bluewater Bay in 1992. George’s love of his church and family was clear to all who knew him. He was a member of Good Shepherd Lutheran Church, and served as chair of the church properties board for over a decade. From the WSJ May 30, 2006. “George and Lucy Tiedemann discovered they had fewer legal rights than other kinds of policyholders when they tried to sue Thrivent. 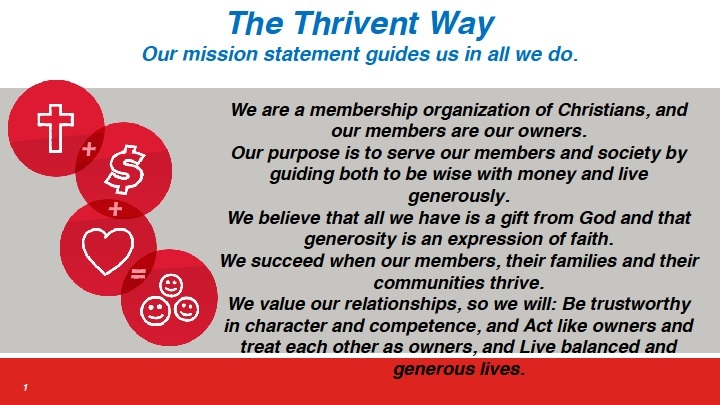 Devout Lutherans, the Niceville, Fla., couple never considered buying life insurance from anyone but the Aid Association for Lutherans, which became Thrivent after it merged with the Lutheran Brotherhood in 2001. But the policies proved far costlier than their sales agent represented, they say, because of overoptimistic projections the agent made in marketing the policies. Changes to policyholders’ recourse in disputes has taken on deeper significance as allegations of unfair sales practices have been leveled against many insurers, including fraternal organizations, over the last decade. Since the late 1990s, Thrivent has faced at least a dozen lawsuits on behalf of thousands of policyholders. Because of its rule change, it has been able to keep many of these cases out of court. Spokesmen for fraternal societies that require arbitration say it’s a fast, fair and efficient way to handle disputes. A Knights of Columbus spokesman says mandatory arbitration “saves everybody money, and our members prefer it.” A Woodmen of the World spokesman says that as a membership organization, it wouldn’t be practical to apply different rules to different policyholders. The insurance the Tiedemanns bought in 1993 didn’t restrict their ability to sue over disputes. But in 1999 Aid Association for Lutherans amended its bylaws, effectively blocking policyholders from the courts and substituting a three-step dispute-resolution process.